It is that time of year we all wait for, an end to winter. With the cold weather disappearance it is also a time for other problems to show up, In the case of today’s topic – Leaking ceilings. You will notice I didn’t say leaking roofs as a leak in a ceiling could be more than just a leaking roof. There are three primary reasons you may see water dripping from your ceiling in the spring or in the warm spells in the winter. Lack of insulation and or vapor barrier. Inadequate ventilation of the attic. Snow coming in through the gable and ridge vents. Ok now that we know what the causes are of the leaks we need to discuss why the ceilings eventually leak. Most people have the misconception that insulation stops heat loss so the more insulation the better. This is not quite right. First of all insulation is meant to slow the rate of heat loss, not eliminate it. This means if we add heat to a room for 15 minutes for example it will make that room comfortable for an hour let’s say. The heat loss is primarily up through the ceilings as heat rises. In this case the type of heat loss is through conduction. If someone opens a door then the heat loss would be through convection. Radiation is the last type of heat transfer that plays more of a roll in the problems we see above the ceiling. Radiation is primarily from the sun. Here is generally how the insulation and ventilation all works or doesn’t work together to keep your home healthy and dry. Older homes primarily will have issues with ice damming while newer homes will have more issues with frost forming in the attic. Older homes did not value air tightness and attic ventilation as much as we do today. For instance older homes did not use vapor barrier and many of the homes did not have any soffit vents. Some older homes did not have any eaves at all so adding soffit vents is impossible in that case. The heat in a room in the winter months is usually around 20 degrees while the outside temperature is – 20 or colder. This means the heat in the room is moving up through the insulation until it reaches the cold attic space. In a properly insulated and ventilated attic the warm air mixes with the cold (-20) attic air and eventually is pushed or pulled out of the attic harmlessly. The problem is that sometimes the warm air is not mixing with enough cold attic air above the insulation before it touches the sheathing on the roof. Now the heat energy in the warm air is being transferred to the roof sheathing (wood) where it in turn moves up into the snow above the roof. Ice damming is now beginning to form on top of the shingles. As the warm air melts the snow on the roof it starts to run down toward the eave where it meets the outside wall. At this point the water freezes because there is no longer a source of heat feeding the melting process. Each time there is excessive heat loss up through the insulation and the weather conditions are just right you will get more melting. If there is a large buildup of snow on the roof it will act to insulate the heat in and encourage more melting. Now the ice at the eaves gets thicker until it is 4 – 10” thick and large ice cycles will also hang off the eaves. This big chunk of ice at the eave is now acting like a water dam for more melt water that is running down the roof. When the dam is high enough the water behind the dam is high enough to run up under the shingles above it. Next thing you know you have water running in through your ceiling. Now that you understand ice damming you should know that there are several ways to prevent ice damming. I will assume you have done all you can with the insulation, vapor barrier and ventilation at this point. Once the home is experiencing ice damming it is a bit late to think about adding ice and water shield under the shingles and vapor barrier under the drywall. The suggestions below are ways to deal with ice damming from the outside. The easiest thing you can do is pull the snow off the roof near the eaves so it loses its R-value and reduces the rate of melting on the roof. Be careful doing this. Another approach is to try to melt the ice that has already formed at the eaves. The critical part is to provide a path for the water to follow off the edge of the roof. One approach is to use heat tape that can melt the ice. Another way is to use calcium or salt to melt it. I have seen some people use a nylon stocking full if road salt to melt a path through the dam but I don’t know how well that would work. Newer homes with leaking ceilings are generally a result of poor ventilation and not because of vapor barrier or insulation although both those things can contribute to the problem of frost. 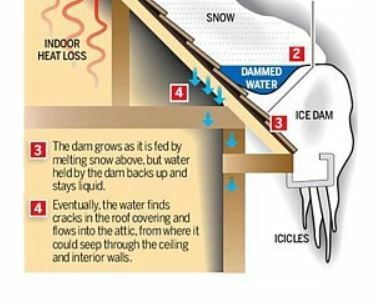 The problem of frost is very similar to ice damming in that heat enters the attic from the warm conditioned space inside the home. The heat rises up until it reaches the sheathing and forms frost. Improperly vented bath fans are a usual problem here as the warm moist air from a shower will add a lot of frost in the attic. Another possible cause of frost on the attic sheathing is extreme fluctuations in outside temperatures. This is something that is impossible to control and usually will not cause any problems inside the home. Visit this site as well for a great article on Ice damming.